If you know me, you know once I have my mind set on something, and my expectations are not met, I am severely disappointed, to the point where it ruins my day (I know it’s bad, but it’s true, and I need Jesus!) So imagine my disappointment when I drove up to the Highland Mall to have Asher visit the Easter bunny only to discover the bunny wasn’t there. Now I know this mall is basically dead, but I thought Santa and Easter bunny’s at the mall were like peanut butter and jelly. Grrrrrr. I even brought my camera so I could capture Asher’s sheer terror when he sat on his lap. Well, what am I, ‘Ms. Don’t Change the Plans on Me’ to do? Expected outcome of the morning: pictures of Asher with bunny. 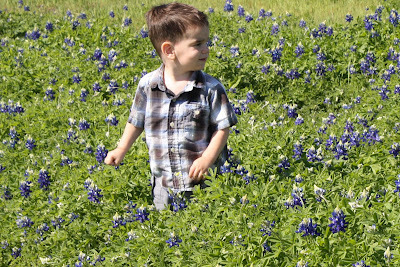 Modified expectations of the morning: pictures of Asher in the bluebonnets! Yeah, that’s it! 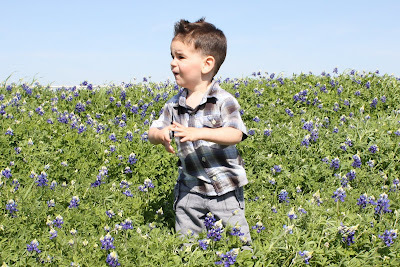 I will find bluebonnets and I WILL get pictures today of Asher! 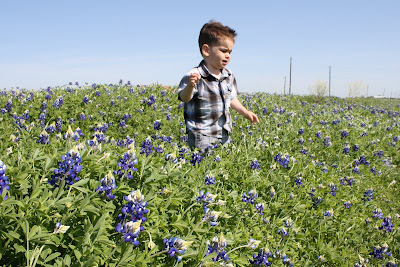 So, we drove halfway to Taylor and found a patch on the side of the farm road. 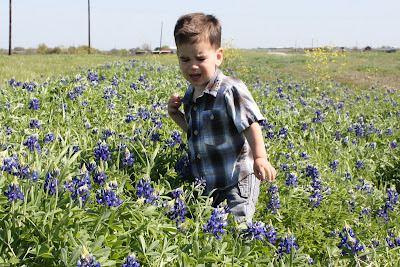 Asher was not thrilled when I stuck him in the middle of the patch which came up to his waist. 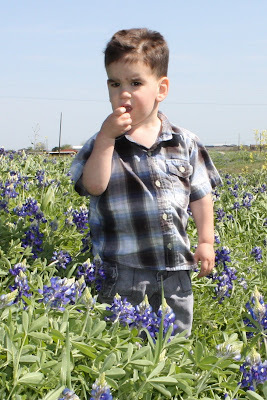 I think he had some sort of bluebonnet anxiety and felt trapped. Oh well, I was going to get pictures so he had to deal. Enjoy! When all the kids are in school you’re going to have to get a dog! « Ella’s first soccer game!